While there are numerous great bands that have become legendary over the decades, not all of them are groundbreaking and have an instant impact. For everyone like The Beatles or Hendrix who instantly changed everything that came before, there are other bands like The Who or the Rolling Stones who burst on to the scene but then had to build up in order to make the huge impact they eventually would. Perhaps no band who falls into the first camp is as polarizing as Led Zeppelin. While they are rightly regarded one of the greatest bands of all time, from the minute they debuted in 1968, people seem to either love them or hate them and this has continued to remain the case even to the present. For those who don't know, the band was, from left to right above: John Bonham (drums), Robert Plant (vocals), John Paul Jones (bass guitar, piano, keyboards, mandolin, mellotron, acoustic guitar), and Jimmy Page (electric and acoustic guitars, mandolin). The band's line-up was unchanged over the course of their entire career, which spanned 1968-1980. The Yardbirds folded in 1968 but Page wanted to carry on with a band steeped in his own vision. However, he and manager Peter Grant were left with a handful of concert obligations to fulfill and the various promoters wanted the name recognition of "The Yardbirds," so it was up to Jimmy to put a new band together. He did this first by calling on friend and fellow London session musician John Paul Jones. After an aborted attempt to get Terry Reid in as his singer, he visited Birmingham to check out a singer he'd heard about and was blown away by Robert Plant. Plant suggested his friend, former bandmate, and fellow Brummie John Bonham as their drummer. A preliminary jam in a London basement confirmed that they had some special chemistry. After fulfilling the remaining concert dates as The New Yardbirds, they renamed the band Led Zeppelin in late 1968, modeled on a remark made by Who drummer Keith Moon, who back in 1966 contemplated forming a supergroup with fellow Who bassist John Entwistle and Jimmy Page, cracking that it would go down like a "lead Zeppelin." Backed by their relentless commitment to touring, Peter Grant's savvy and revolutionary management, the willful refusal to partake in standard music industry promotion, and the building-up of a fanatic and loyal fanbase solely by word-of-mouth, Led Zeppelin went on to become the biggest band of the 1970s and one of the biggest bands of all time. Their career can be split into different phases: their early blues-based hard rock, in keeping with the times and contemporaries like Cream and the Jimi Hendrix Experience; their middle-period, which produced some of their best music where they fully achieved their desired perfect balance between hard rock, acoustic and folk music, and sophisticated arrangements, and their last phase where they became a bit more subdued and experimental (influenced in large part by the inner turmoil the band experienced during their final three years). Zeppelin's first three albums are among their most famous and contain numerous staples of classic rock radio. Songs like "Whole Lotta Love," "Communication Breakdown," "Immigrant Song," "Heartbreaker," and many more remain hugely popular songs to this day. The music was very heavy and riff based and leaned heavily on their blues influences, but the most textured and nuanced side of the band began to shine through with tracks such as "Ramble On," "That's the Way," and "Thank You." (As an aside, I can only imagine what this must have sounded like for the first time in the late 1960s. My dad has told me that when he first heard Led Zeppelin in 1969 as a high school student, it blew his mind and sounded like nothing he'd heard, and he was by that time already a big Hendrix and Cream fan). It was with their fourth (and untitled) album in 1971 where the band really began to bring their vision to fruition, and no song encapsulates this more than the epic and classic "Stairway to Heaven," which is the most played song in the history of radio and one that needs no introduction. The entire album is a goldmine in terms of instrumentation and production (something for which Jimmy Page is also rated highly for). By the time they released their following two albums, 1973's Houses of the Holy and 1975's Physical Graffiti, it seemed effortless the way they incorporated their burgeoning interest in world music into their other influences. "Kashmir" blends Arabic sounds with hard rock, "Trampled Underfoot" is the band at their funkiest, "The Song Remains the Same" is the closest they ever came to sounding like The Who, and "The Ocean" combined their heavy riffing with a coda hearkening back to the 1950s music they grew up on. Tragedy struck in between the two legs of their world tour of 1975, however, when Plant and his family were seriously injured in a car crash while on vacation in Greece. The resulting album, 1976's Presence, is Zeppelin's most monochromatic-sounding and despairing record but is also one of their best. "Achilles Last Stand," "Nobody's Fault But Mine," "For Your Life," and "Tea For One" are harrowing in their darkness and even the lighter moments on the album have an undercurrent of unease. Further tragedy struck in the middle of the 1977 tour when Plant's young son died of a viral infection. The final album, 1979's In Through the Out Door, was transitional but ended up being their last. Jones and Plant steered the ship here since Page was lost in the depths of his heroin addiction, while Bonham sunk further into alcoholism and the stresses of a lawsuit in the USA hanging over his head (he, along with others in the Zeppelin crew, severely assaulted a member of Bill Graham's staff near the end of their '77 tour). The album is more keyboard-heavy and while uneven, does have some fine cuts, including "In the Evening," "Fool in the Rain," the epic "Carouselambra," and a fitting closer to Led Zeppelin's studio career, the bluesy "I'm Gonna Crawl." Sadly, weeks before their return to America and their upcoming US 1980 tour John Bonham died in September '80, thus ending the band. A further album of outtakes and leftovers, 1982's Coda, was released. The surprising thing about the album is that half of it comprised outtakes from In Through the Out Door, all of which were better than many of the songs that made the released album ("Hot Dog," anyone?). "Ozone Baby," "Darlene," "Walter's Walk," and "Wearing and Tearing" hinted at the more aggressive and punky sound Zeppelin discussed as their intended way forward into the 1980s before they were abruptly cut short. Personally, Led Zeppelin is one of my favorite bands for a variety of reasons. They are one of my dad's favorite bands and hearing them on his records comprise some of my earliest musical memories. I even had a poster of my dad's from his college days hanging on my own wall in high school and college. As a guitar player, Jimmy Page was definitely one of my "tutors" as I taught myself how to play by playing along to the songs, and the breadth of styles he was adept at, especially his acoustic and fingerpicking, continues to baffle me. The mysterious quality around the band, enhanced by the packaging of their albums, the lyrics, and the lack of personal access to the band members in an antithetical way to a band like the Beatles created a mystique around them that still endures. Finally, they were one of the greatest live bands of their era and while the quality of their performances grew more uneven from about 1975 onward, when they delivered, they were unbelievable. Their peak years between 1971 and 1973 have to be heard to be believed. The band reunited a few times since 1980, once for a horrid performance at Live Aid in 1985 that Robert Plant regrets to this day, and again in the late 1980s (with Bonham's son Jason on drums) for an Atlantic Records anniversary. Most famously and recently, they reunited in 2007 for a show in London as a tribute to Atlantic Records founder Ahmet Ertegun (again with Jason Bonham) showing that they still have the magic between them although Plant has repeatedly refused to do anything else in Led Zeppelin. 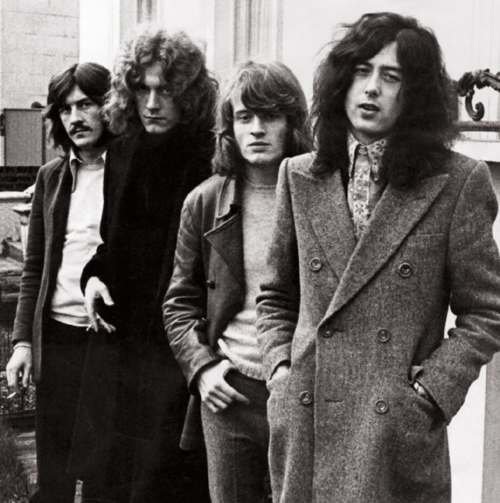 While they didn't have the cultural impact and cross-generational appeal of the Beatles, it can still be argued that Led Zeppelin was to the 1970s what the Beatles were to the 1960s...the defining band of their decade and times.